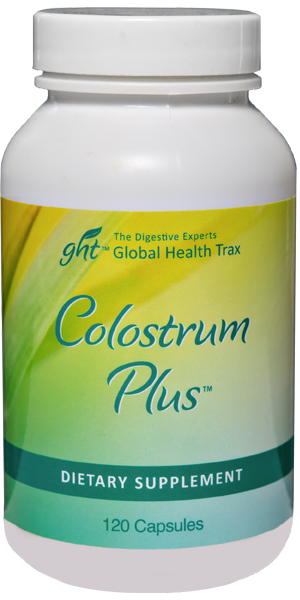 Colostrum, also known as first milk, is produced in late pregnancy and is high in nutrients, antibodies, carbohydrates, protein, and low in fat. It may assist with building growth factors, such as tissue building and muscle/bone repair. 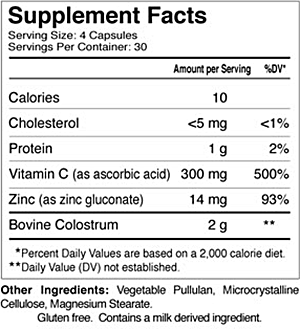 Colostrum, Vitamin C and Zinc all promote a healthy immune system. Growth and repair of tissues – Vitamin C helps the body manufacture collagen, which is essential for the healing of wounds, and for the repair and maintenance of cartilage, bones, and teeth. Healthy skin – Collagen is also critical to the formation and ongoing health of skin and when applied topically Vitamin C may help aged skin feel less rough and stay hydrated, decreasing the appearance of lines and wrinkles. Immune system boost – Vitamin C increases white blood cell production and is important to immune system balance. Neutralizing free radicals – Vitamin C is one of many antioxidants, which are nutrients that block some of the damage caused by free radicals like aging. Antioxidants also help reduce damage to the body caused by toxic chemicals and pollutants. Gallbladder health – Taking vitamin C daily may help maintain normal gall bladder function. Did you know that nearly 100 different enzymes rely on zinc to help speed up vital chemical reactions in the body? Zinc plays an important role in the structure of proteins and cell membranes, and is required for the development and activation of white blood cells. Adequate zinc intake is essential in maintaining the integrity of the immune system. Zinc also plays a role in cell signaling and has been found to influence hormone release and nerve impulse transmission.